Floss Shreds: One popular belief acknowledged by many dental hygiene experts is the potential for floss to shred and get stuck between your gum and implant. Floss or any particles left behind will cause an inflammatory response that can damage the bone surrounding your implant. Flossing is Technique Sensitive: Natural teeth attach to the bone by connective tissue called periodontal ligaments. These ligaments surround the tooth and act as a protective barrier against invading bacteria. Dental implants lack periodontal ligaments so instead of being attached to the implant the surrounding tissue creates a protective seal that can be easily broken with aggressive flossing. If your dentist or dental hygienist recommends dental floss for at home maintenance, this should be met with instructions that include hands on demonstration to ensure a safe and effective technique. The Feel of a Larger Space: Dental floss is most beneficial when used as a preventative tool to mechanically remove bacteria from the tooth surface and the tight space between the gums surrounding your teeth. Depending on the design of the restoration, spaces between implants may present in a variety of shapes, sizes and depths. For this reason, home care recommendations need to be customized so that you are using the right size “in-between cleaner” best suitable for the size of the space. Interdental brushes have become the new standard of care for keeping the spaces in-between your implant food and plaque free. Oral irrigation has also been included in the implant care plan for complex cases and for patients with dexterity. Tooth loss can be debilitating to the overall health of your body. 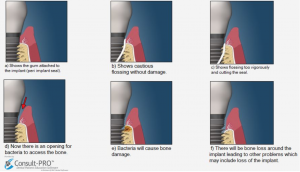 Dental implants are changing people’s lives and improving overall health. However, traditional standards recommended by professionals for at home maintenance may not be fit for the patient with dental implants. Regardless of the case, dental hygiene professional and home care recommendations need to be customized to meet your individual needs, and therefore may require more than the traditional toothbrush and floss. This entry was posted in Hygiene. Bookmark the permalink.